This photo has suddenly become my daily most viewed photo for the past 10 days or so. Yesterday it had 32 views. It had 30 a couple of days before that. As of 2100 on 21 Oct, it has 22 views. [Almost] All of the views have been coming from Google and Yahoo image searches. I wish flickr told me what search terms were leading to this little guy. I’d try a few really quick. “Pope John Paul” (no quotes) does not bring it up on the first page. “Pope John Mole” and “Pope Mole” (again, both without quotes) do bring it up as the first search result. But why would someone be searching with those terms? It just doesn’t make any sense. The image already has 1814 views for all time. 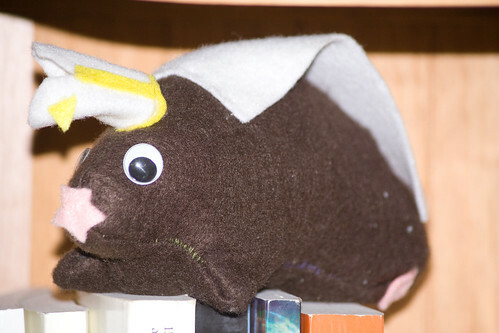 Back in High School, many moons ago, we had to make stuffed moles when we were learning about moles in Chemistry. They had to be creative, usually revolving around work play with the word mole. This was mine. I still have it after all these years and it now keeps guard over Danielle’s anthro books.